The winner of the annual Deutsche Börse Photography Prize was announced on Monday 12 May 2014: Richard Mosse. Other photographers, who were shortlisted for this year’s prize, were: Alberto Garcia-Alix, Jochen Lempert and Lorna Simpson. The Deutsche Börse Photography Prize 2014 is organised by The Photographers’ Gallery and is on display there until 22 June followed by presentations at the Deutsche Börse headquarters in Frankfurt/Eschborn, from 17 July until mid September. The members of the Deutsche Börse Photography Prize 2014 jury are: Kate Bush, Curator; Jitka Hanzlová, Artist; Thomas Seelig, Director/Curator, Fotomuseum Winterthur; and Anne-Marie Beckmann, Curator, Art Collection Deutsche Börse, Germany. Brett Rogers, Director of The Photographers’ Gallery, is the non-voting Chair. (b. 1956, Spain) is nominated for his publication “Autorretrato/Selfportrait”, La Fabrica Editorial (2013). The book features black and white self-portraits which offer an insight into the artist’s life over nearly four decades. These include the upheavals at the end of Franco’s dictatorship in the early 70s through newly gained liberties in the mid-80s and into the present day. The works reflect a life of both intimacy and excess, where photography is used to mediate experiences, fears, neuroses and inner battles. His tense and lyrical images blur – visually and metaphorically – the line between self-reflection and staged portraits. In his wider practice, García-Alix also combines photography with writing and video work. (b. 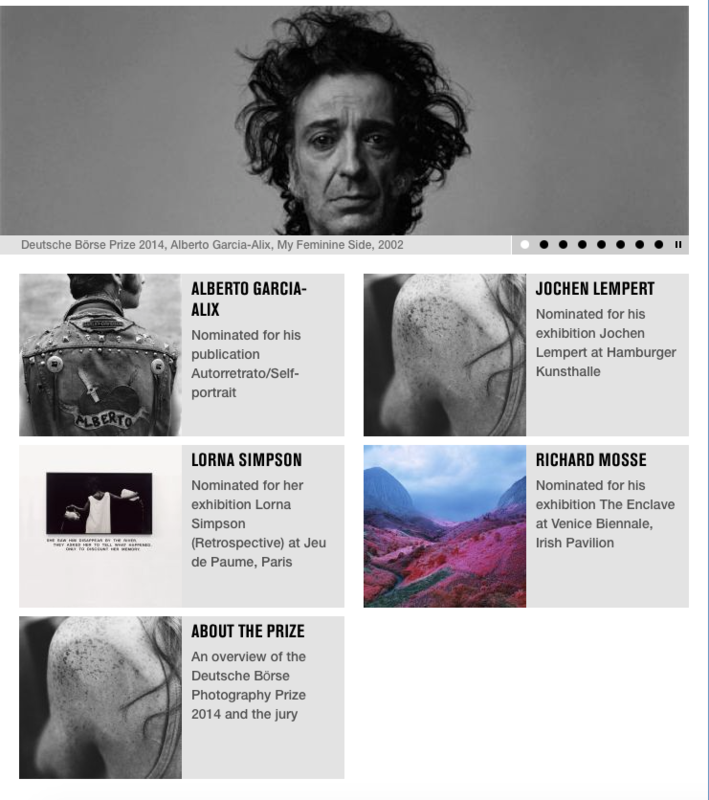 1958, Germany) is nominated for his exhibition “Jochen Lempert” at Hamburger Kunsthalle (22 June – 29 September 2013). Originally trained as a biologist, Lempert has been using photography since the early 1990s to study humans and the natural world. His approach is scientific and poetic as well as humorous. Always working in black and white, his work engages with a diverse range of subjects and genres, ranging from everyday views, to abstracted details. Photographic series alternate with single pictures, highly contrasted images with almost blank papers, through which multiple links and subtle associations are woven. (b.1980, Ireland) is nominated for his exhibition “The Enclave” at Venice Biennale, Irish Pavilion (1 June – 24 November 2013). Mosse documents a haunting landscape touched by appalling human tragedy in eastern Democratic Republic of Congo, where 5.4 million people have died of war related causes since 1998. Shot on discontinued military surveillance film, the resulting imagery registers an invisible spectrum of infrared light, and renders the jungle warzone in disorienting psychedelic hues. At the project’s heart are the points of failure of documentary photography. It is an attempt to find an alternate strategy to adequately communicate this complex and horrific cycle of violence. (b. 1960, USA) is nominated for her exhibition “Lorna Simpson (Retrospective)” at Jeu de Paume, Paris (28 May – 1 September 2013). Simpson’s work links photography, text, video installations, most recently archival material and found objects. Emphasizing a conceptual and performative approach, she explores themes of gender, identity, culture, memory and body. Simpson works within the charged duality of past and present, word and image but also plays with the interplay between still and moving images.